A court in the Italian city of Turin has heard an allegation that a Sicilian Mafia boss convicted of 1990s bombings boasted of ties to Silvio Berlusconi. Mafia informant Gaspare Spatuzza was giving evidence at the appeals trial of Marcello Dell'Utri, a co-founder of the Italian prime minister's party. He said the Mafia boss had claimed to have Mr Berlusconi's support. 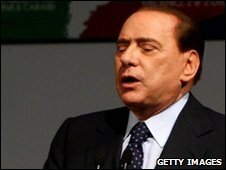 A spokesman for Mr Berlusconi, who denies the allegations, suggested the Mafia was trying to discredit the PM. Mr Spatuzza, a prosecution witness, gave evidence from behind a screen in the courtroom, surrounded by several bodyguards. Ten people were killed and dozens were injured in the 1993 attacks. The informant recounted an alleged meeting in 1994 with the Mafia leader, Giuseppe Graviano, who was later convicted along with his brother for the bombings in Rome, Milan and Florence. He said that Graviano had boasted of his connections to media tycoon Silvio Berlusconi, who was then on the cusp of his political career. "Two names were mentioned, one of them was Berlusconi's," he told the court. "I asked if he was the one from Channel Five and he told me 'yes'." "Graviano told me that thanks to the seriousness of these people, we had the country in our hands," he added. The spokesman for Mr Berlusconi, who is not formally linked to the case of his political associate, said the Mafia was attempting to get its revenge on Mr Berlusconi's administration for its fight against organised crime. "It is completely logical that the Mafia would use its members to make statements against the prime minister of a government that has acted in a determined and concrete way against organised crime," Paolo Bonaiuti said, quoted by to Reuters news agency. Marcello Dell'Utri is appealing against a conviction for Mafia association and a nine-year prison sentence. Speaking to reporters at the Turin court, Mr Dell'Utri said the claims were nothing news and "all false". He said he was unworried by the evidence. "And of course Berlusconi is completely calm about it too - he's more afraid of his wife than Spatuzza," he said, referring to the prime minister's ongoing divorce proceedings.